Durga Puja festivities in Kolkata attract lakhs of people from across the country. One of the biggest attractions for people visiting the City of Joy, at this time of the year, are the thousands of creative Puja Pandals with unique themes. 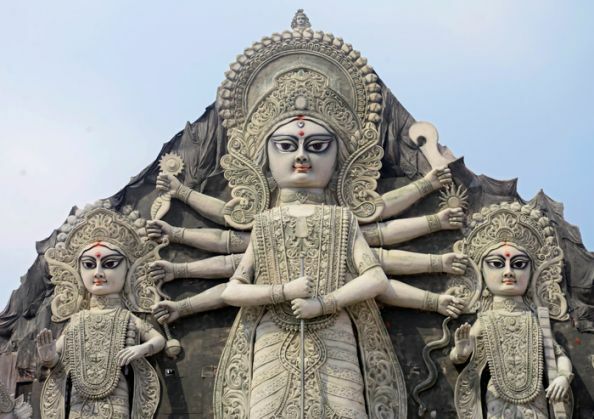 This year, the Deshapriya Park's pandal in South Kolkata was the talk of the town for its 'world's largest' Durga idol, standing at 88 feet tall. However, according to a report in The Hindu, the pandal has been shut down by the Kolkata police for a year, one day after a stampede like situation prevailed at the venue. The Commissioner of Police, Surajit Kar, said that the pandal was illegal because it did not comply with the rules. As per a Calcutta High Court ruling, the height of an idol cannot be more than 40 feet while the Deshapriya park idol is 88 feet tall. Why did the decision come so late? According to the police, they got to know about the actual height of the idol only when Saurav Ganguly reached the place on 17 October, to inaugurate the idol. The Hindu report claims that senior police officials admitted to being aware of the issue but no step was taken as they thought the matter will be resolved. The relatives of Debasish Kumar, a Trinamool Congress leader, reportedly manage the Puja committee's functioning.